First airing in 1966, with a promise to “boldly go where no man has gone before,” Star Trek would eventually become a bona fide phenomenon. Week after week, viewers of the series tuned in to watch Captain Kirk, Spock, and the rest of the crew of the USS Enterprise as they conducted their five-year mission in space. Their mission was cut short by a corporate monolith that demanded higher ratings, but Star Trek lived on in syndication, ultimately becoming a multibillion-dollar media franchise. With merchandise spin-offs, feature films, and several television iterations—from The Next Generation to Discovery—Star Trek is a firmly established part of the American cultural landscape. In Star Trek: A Cultural History, M. Keith Booker offers an intriguing account of the series from its original run to its far-reaching impact on society. 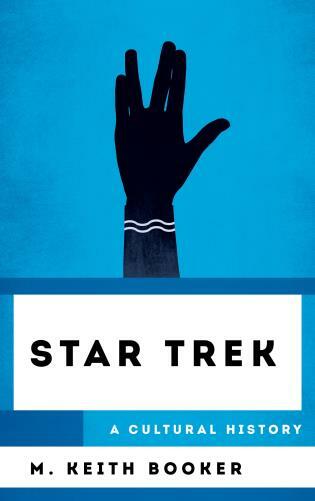 By placing the Star Trek franchise within the context of American history and popular culture, the author explores how the series engaged with political and social issues such as the Vietnam War, race, gender, and the advancement of technology. While this book emphasizes the original series, it also addresses the significance of subsequent programs, as well as the numerous films and extensive array of novels, comic books, and merchandise that have been produced in the decades since. M. Keith Booker is professor of English at the University of Arkansas. He is the author or editor of more than fifty books, including The Encyclopedia of Comic Books and Graphic Novels (2010), Historical Dictionary of Science Fiction Literature (Rowman & Littlefield, 2014), Mad Men: A Cultural History (Rowman & Littlefield, 2016), and Tony Soprano’s America: Gangsters, Guns, and Money (Rowman & Littlefield, 2017). Trekkers will love this thoughtful study of their favorite franchise's cultural influence. Unlike many books about Star Trek history which deal strictly with the series and its personalities, Star Trek: A Cultural History plugs the series history into the times during which the series were made. . . . [An] easy and fairly quick read and it held my interest until the end. I think for fans born after the 1960s, especially those from the 1980s on, this book would be useful for understanding the show as you need to know the context of the time to truly judge a show properly. A show that originally resonated with science fiction fans, Star Trek has also intrigued the general public due to its engaging characters, exciting plotlines, and vision of a better future. It is those exact elements that allowed Star Trek to go from simply a good show to the massive media franchise it is today. Star Trek: A Cultural History will appeal to scholars of media, television, and popular culture, as well as to fans of the show.